”Most for-profit insurance companies spend 87 cents out of every dollar to pay physicians, hospitals, pharmaceutical companies and other medical providers for medical care. This number is disputed somewhat by some experts, who put it at 82 cents, leaving five more cents for overhead and profit, but in a typical scenario, here is how your insurance company spends each dollar of your premium. Activities that improve healthcare quality – what an interesting definition. Are trips to the tropics for rest and relaxation by health insurance professionals in this number? The answer is yes. Take some time and go look at what is listed. It is the internal cost of the insurance company that can be almost anything. So we are depending on the health insurance companies to determine healthcare quality and not based on our expectations. After all, quality is defined as meeting the customer’s expectations. I personally expect at least eighty percent of my insurance dollar to go to provider care as Ms. Nancy stated. So where is the rub? Let’s play with the numbers. My expectation is that only the provider payments should be on top and the cost of the insurance companies to be under the line. Let’s take a typical insurance company in one state with the numbers shown in billions of dollars. Total premiums collected 18 billion. Let PP = 10 and on top with the rest on the bottom as QQ = 5, SG&A=2, Profits = 1 or 28%, 11%, and 6% respectively. This gives us a ratio of 55% or payments to medical providers. This is very typical of a business loss ratio. Let’s do it the way that Obamacare defines it: 10+5/10+5+2+1= 83% – Right in line with policy. But wait, what if we reversed provider payments versus the outlays to improve healthcare quality? The ratio is still the same but provider payments are cut in half and the health insurance company gets twice as much. Delivering your money in the tropics with feet in the sand. The government has decided that health insurance companies are concerned about your health, the quality of healthcare, and not their profit – yeah, right. 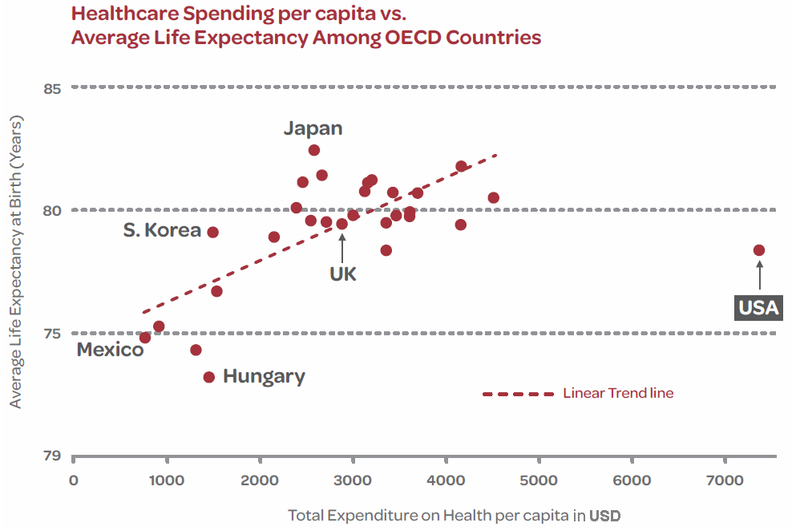 This explains why when compared to the rest of the world we spend twice as much for healthcare with low expectations for life. Mary Meeker’s State of the USA.